Week 3 produced another spate of untimely injuries across the NFL landscape over the weekend. Sound familiar? So is life in professional football. 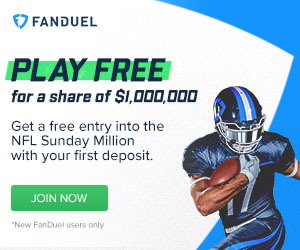 The loss of key players affects those of us in the equally-unforgiving world of fantasy football as well, and as we enter week 4, there are several more names to monitor before the games kick off on Thursday night. Be sure to look out for the following names and then some on the weekly NFL injury reports, the first of which will be released on Wednesday. - Ben Roethlisberger was the latest big-name quarterback to go down, as he suffered an MCL sprain and bone bruise to his left knee during Pittsburgh's win over the Rams. Big Ben was fortunate to avoid any ACL damage, but faces a 4-6 week spell on the sidelines. Michael Vick is the next man up for the Steelers as Ben joins the likes of Tony Romo, Drew Brees, and Jay Cutler on the quarterback injury report. - Cardinals' coach Bruce Arians revealed after his team's win on Sunday that RB Andre Ellington could make his return from a knee injury in week 4. Ellington has not played since picking up his injury in the week 1 victory over the Saints, with Chris Johnson and David Johnson filling in. Ellington returned to practice last week, which is a positive sign in his hopes of facing the Rams next weekend. - Falcons' TE Jacob Tamme exited his team's win over the Cowboys on Sunday with a concussion, leaving his week 4 status up in the air. Fellow Falcon Tevin Coleman (ribs) will be evaluated through the week after missing the game in Dallas. - Sammy Watkins (calf) is facing an uncertain status ahead of week 4. Coach Rex Ryan admitted that Watkins may not be able to suit up after the wideout left Sunday's win over the Dolphins and watched the second half from the sidelines in street clothes. Meanwhile, LeSean McCoy continues to play through the hamstring issue that has hampered him since preseason, with Ryan saying that he has toyed with the idea of resting his running back, but will ultimately let the team's doctors make the final call on Shady's gameday status. - Jonathan Stewart shook off a knee injury and was able to help Carolina defeat the Saints on Sunday, though he briefly exited the game with a new leg injury. However, that ailment does not appear to be a major concern, and Stewart should be fine for week 4. 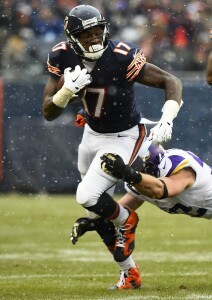 Alshon Jeffery has missed Chicago's last two games. - Alshon Jeffery (hamstring) and Jay Cutler (hamstring) both missed the Bears' shutout loss in Seattle in week 3, though there is a chance Jeffery could return in week 4. Cutler's status remains uncertain after he was unable to practice last week, leaving the signal-calling duties up to Jimmy Clausen. Jeffery's return would be a major boost to whomever is under center for Chicago. - Josh McCown marked his return from a concussion by overseeing a Cleveland loss to the Raiders in which he picked up another injury, this one to his hand. McCown does not consider the injury serious, and says he plans on practicing this week. RB Robert Turbin is looking doubtful for week 4, with the former Seahawk targeting week 5 as a potential return from his ankle injury. - Broncos' RB Juwan Thompson left Sunday night's win over the Lions with a neck injury. He was injured on a goal-line carry, but is said to have avoided any major damage. - Ravens TE Crockett Gillmore missed Monday's practice with a calf injury. Gillmore and the Ravens play the Steelers on Thursday night, so he faces a race against time to be fit for week 4. - Both Eddie Lacy and Davante Adams were active for Monday night's game against the Chiefs. Adams appeared to re-aggravate his injury early in the first quarter, with rookie Ty Montgomery stepping up in his absence. - Texans' RB Arian Foster is inching closer to his return from preseason groin surgery. Coach Bill O'Brien says Foster is "close" to making a comeback, with the 29-year-old reportedly telling teammates he feels good enough to play. Even if he does return, Foster will surely be on a snap count early on. Alfred Blue had a 31-139-1 line in Houston's win over Tampa Bay on Sunday, and more performances like that one will help the team ease Foster back into the mix without any extra pressure. - T.Y. Hilton (knee) was able to play in the Colts' win over Tennessee on Sunday, though Dwayne Allen (ankle) was inactive. Allen was unable to practice last week, so his name will be one to watch on the injury report ahead of week 4. - Denard Robinson (knee) did not play in the Jags' loss at New England on Sunday, and "Shoelace" (can we still call him that?) faces an uncertain week 4 status. Meanwhile, Marqise Lee sat out the second half of the team's heavy defeat with a hamstring injury, though he says he could have played on had the game been closer. - Jordan Cameron (groin) and Lamar Miller (ankle) both shook off their respective injuries to play on Sunday, but could not prevent the Dolphins from falling to defeat at the hands of the Bills. Neither player appeared to suffer any setbacks, and should be considered fine for week 4. - Vikings' wideout Charles Johnson left his team's game with a rib injury, but was able to return. The team is hopeful that Johnson will be able to participate in practice throughout the week and ultimately play in week 4. - Drew Brees missed the first game of his career since the 2003 season as New Orleans fell to the Panthers on Sunday, with Luke McCown performing admirably in his absence. Brees revealed on Monday that he is "very optimistic" he will be able to suit up and play against Dallas in what figures to be a high-scoring game on Sunday night. Brandin Cooks, who popped up on last week's injury report with an ankle problem, played against the Panthers and should be considered fine for week 4. - The Jets now have QB Geno Smith available for week 4 and beyond. Smith, who was cleared to play in week 3, had been out since suffering a fractured jaw in a locker room dust-up during training camp. However, Ryan Fitzpatrick is likely to continue as the team's starter, with the Jets travelling to London to take on Miami in week 4. New York will hope to have the services of Eric Decker (knee) and Jeff Cumberland (concussion) as they head across the pond. - Victor Cruz is getting closer to making his long-awaited return from a gruesome knee injury and subsequent lower-body ailments, with both the player and his coach, Tom Coughlin, expressing optimism in regards to his week 4 status. The 28-year-old's return will be a welcome addition for Eli Manning and the G-men, though Cruz will likely slot in behind Odell Beckham Jr. and Rueben Randle on the target totem pole. - The Eagles have been forced to make a switch at kicker, with Cody Parkey heading to IR due to a groin injury. Caleb Sturgis, formerly of the Dolphins, has been signed to take Parkey's place on the roster. - Ladarius Green missed the Chargers' matchup with Minnesota due to a concussion, and his week 4 status remains unclear. The team won't have Antonio Gates back from suspension until week 5, so Green's return would be a boost for Philip Rivers and the San Diego offense. - Marshawn Lynch left Sunday's win over the Bears with a hamstring injury. Lynch had a calf problem coming into the game, and underwent an MRI on Monday morning. He will be evaluated through the week, with Fred Jackson and Thomas Rawls waiting in the wings should Best Mode be unable to play in week 4. - Vernon Davis suffered a knee injury in the 49ers loss to Arizona on Sunday, though the veteran says it is not a concern. Meanwhile, Reggie Bush is hoping to play in week 4 after missing the last two games with a calf injury. - DeSean Jackson (hamstring) will look to make his return for the Redskins in week 4. DJax has been progressing, but had little chance to play on a short week last Thursday against the Giants. If he can play, Jackson faces a tasty revenge game against his former club, the Philadelphia Eagles in week 4. Remember: keep an eye out on the daily injury reports, the first of which will be released on Wednesday ahead of all the Sunday matchups.